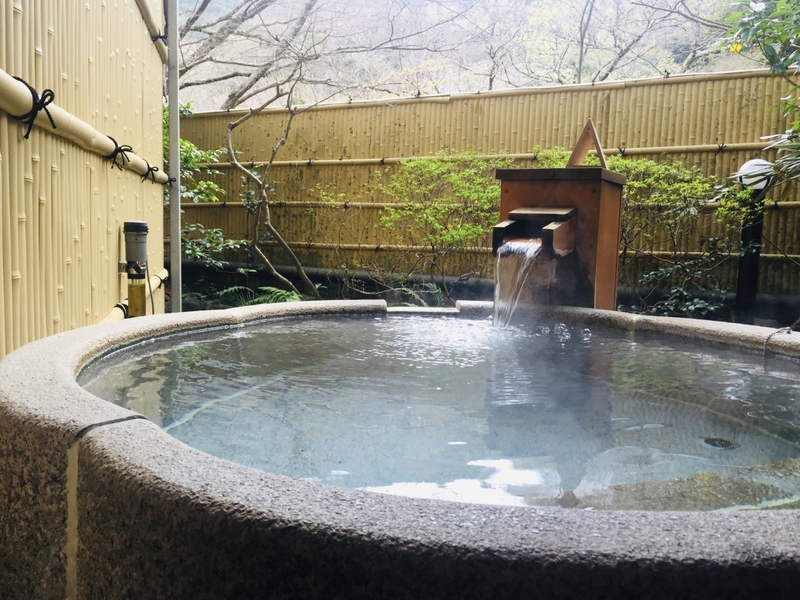 Of the many legends about the origins of the hot springs at Yugawara, south of Tokyo, my favorite one tells the story of Gyouki, the high priest of Yakushiji Temple in Nara. According to this tale, while Gyouki was traveling through the country seeking funds for the construction of the Great Buddha of Nara, he met an ailing beggar in the mountains of Hakone, west of Tokyo. Gyouki carried the beggar on his back and, following his directions, descended the mountains into the valley below where, suddenly, hot water began to gush from the ground. When the beggar bathed in the hot springs, not only was he cured of his ailment, he was revealed to be Yakushi Nyorai, the Buddha of Healing. 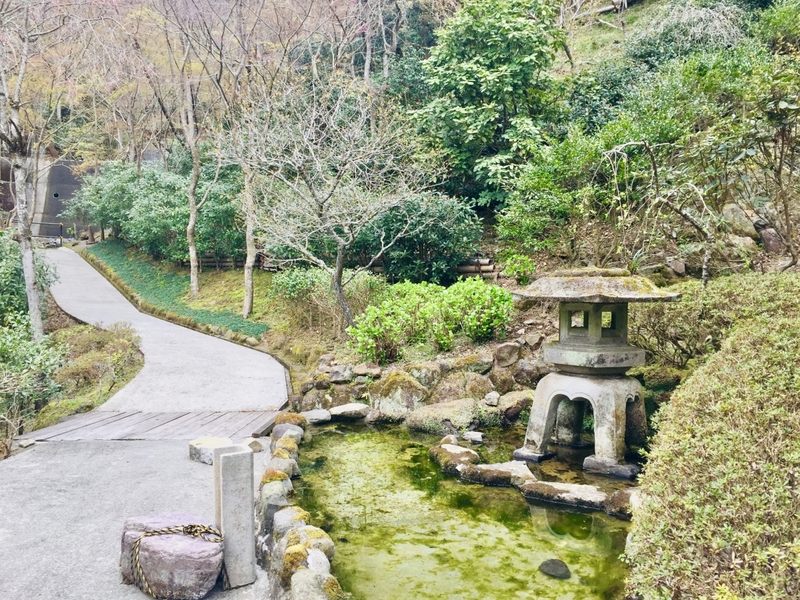 Sandwiched between the picturesque Hakone mountains to the north and the famous seaside resort of Atami and the Izu Peninsula to the south, the hot spring town of Yugawara on Sagami Bay is often overshadowed by its more famous neighbors. 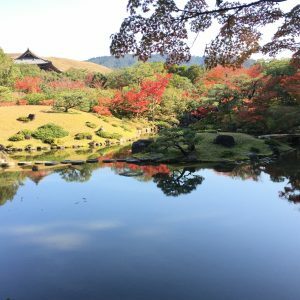 This is a pity since Yugawara, just a short drive or train ride from Tokyo, is an appealing destination for a short break away from the city. For one thing, there are abundant views over the vast Pacific Ocean just east of Yugawara. 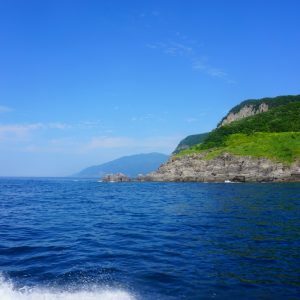 Whether traveling by car or train, visitors will enjoy the panoramic sight of Sagami Bay below rocky cliffs, fringed by deep green mountains and the occasional tangerine grove. The hot springs of Yugawara, which are famous for soothing bruises, cuts and bodily pain, are another good reason to visit. Since October, 2017, the attraction of spending a relaxing evening here at a ryokan, or Japanese-style hotel, has been enhanced by the opening of the Enoura Observatory, a sprawling, cliff-top homage to the arts by famed artist and photographer, Hiroshi Sugimoto. So, while it is called an “observatory” – presumably based on Sugimoto’s conviction that the search for meaning and identity is the driving force behind both art and the act of observing the universe – Enoura is really an open-air museum where art, architecture and astronomy come together with nature. After rave reviews from friends who had visited the site, we decided to start our Yugawara trip at the Enoura Observatory. It was a cloudy day, unusually cold for March, but the rapeseed flowers and cherry blossoms were there to greet us in full bloom. 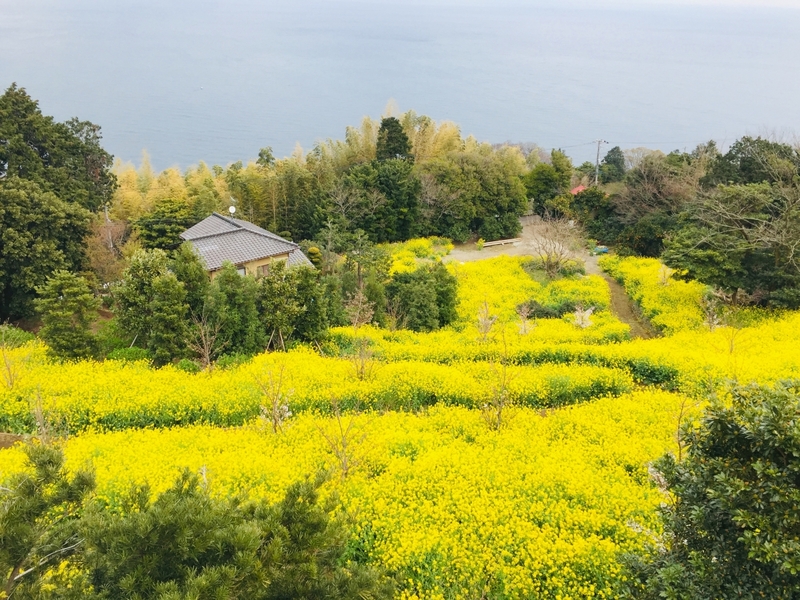 A carpet of nanohana, or rapeseed flowers, extends down to the ocean below. Sugimoto is a tireless collector of everything from ancient stones to fossils and temple fittings. As I wandered through the grounds marveling at the history of the objects on display, I wondered how Sugimoto managed to find and purchase such objects, many with an extraordinary lineage. 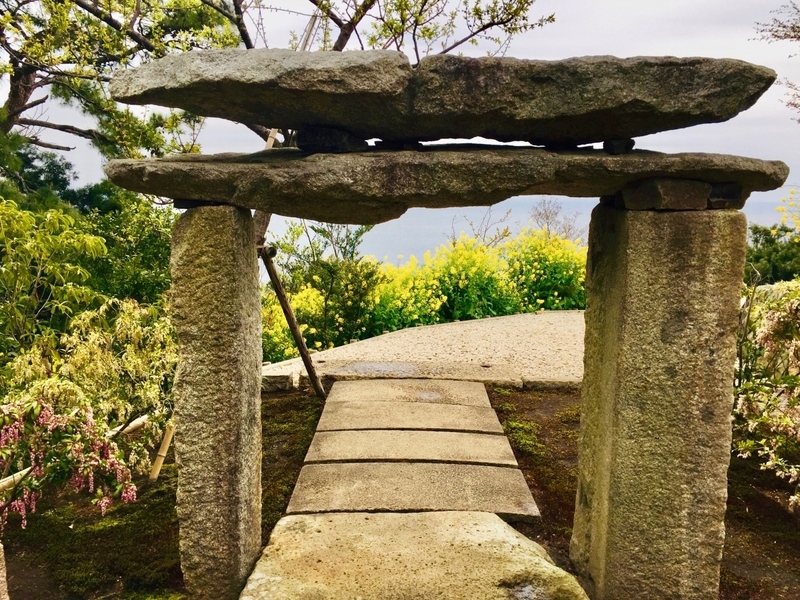 For example, an unassuming, though ancient, Shigaraki well frame, which sits inconspicuously on a patch of moss, was once owned not only by Kitaoji Rosanjin, the famed Japanese artist, potter and epicure, but later by Koybayashi Hideo, a renowned author and literary critic. The Meigetsu Gate was originally built as the front gate of the Meigetsuin Temple during the Muromachi period (1336-1573). A stone gate built to resemble an old-style torii gate. 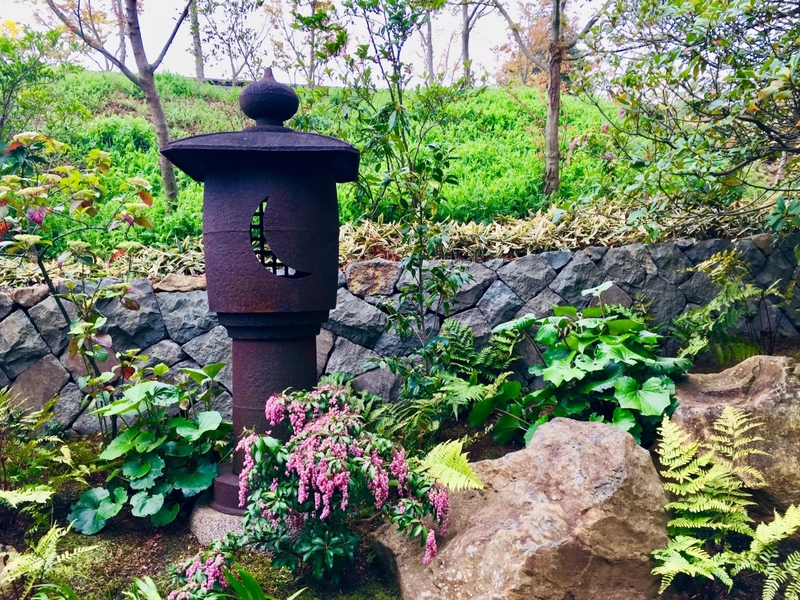 This unusual iron lantern is believed to date from the Momoyama period (1573-1603). After a full morning roaming the Enoura Observatory, we followed a friend’s recommendation and stopped for lunch at Rengaya, a 1970s-style restaurant a short walk down the mountain from the Observatory’s parking lot. 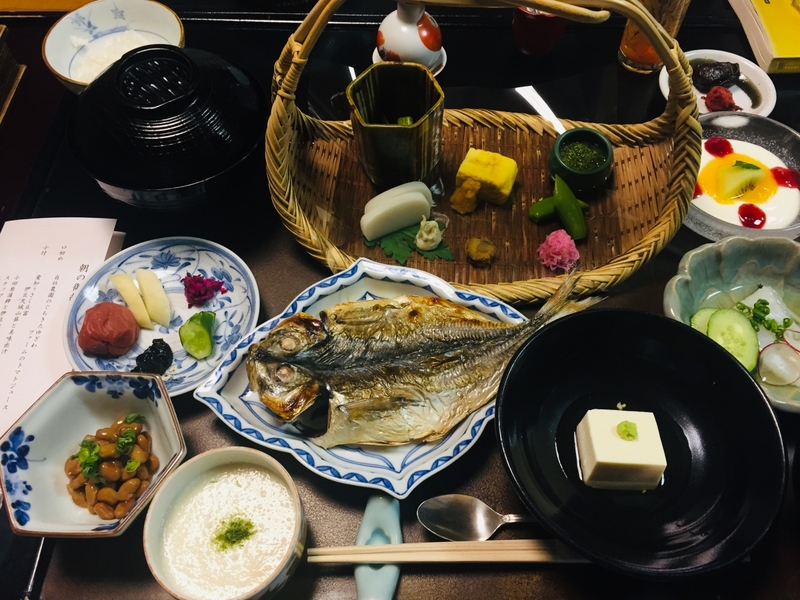 Rengaya serves both Japanese and western-style dishes, using local ingredients sourced on the day, but the biggest draw is its sweeping view of Sagami Bay. The lunch set I chose, which featured a mixed salad, grilled fish, rice and miso soup, was hearty though unremarkable. After lunch, we drove to Arai-joshi, a park in the neighboring town of Manazuru on a site where Arai Castle, home to Yoshiatsu Miura, once stood. Yoshiatsu committed suicide when the castle fell to his enemy, Soun Hojo. While nothing remains of the castle, the site is known for its bamboo grove and weeping cherry trees. While in Yugawara, we could not resist stopping at Murakami, a handsome store just outside the JR station, which sells Japanese sweets. It is hard to miss the entrance to Murakami. Originally from Kanazawa, in northwestern Japan, Murakami’s rice cakes are delicate and not too sweet. My favorites are the small, soft cakes coated with sesame seeds. Our hotel for the evening was Tubaki (pronounced “Tsubaki”), a Japanese-style ryokan in Yugawara, just a short drive from the Enoura Observatory. 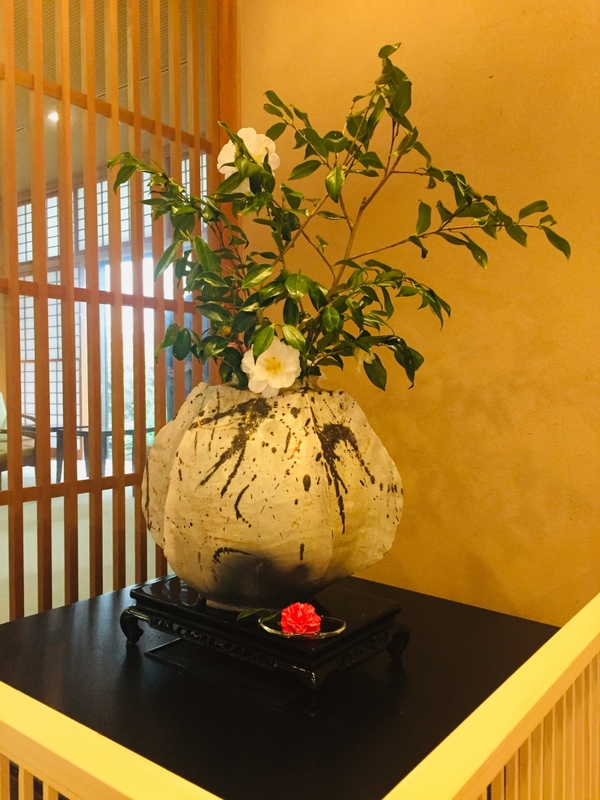 The hotel takes its name from the Japanese word for camellia, a popular, winter-blooming flower that often adorns tea rooms and the alcoves of traditional homes. True to its name, the hotel has planted a variety of camellia bushes in its garden for guests to enjoy. 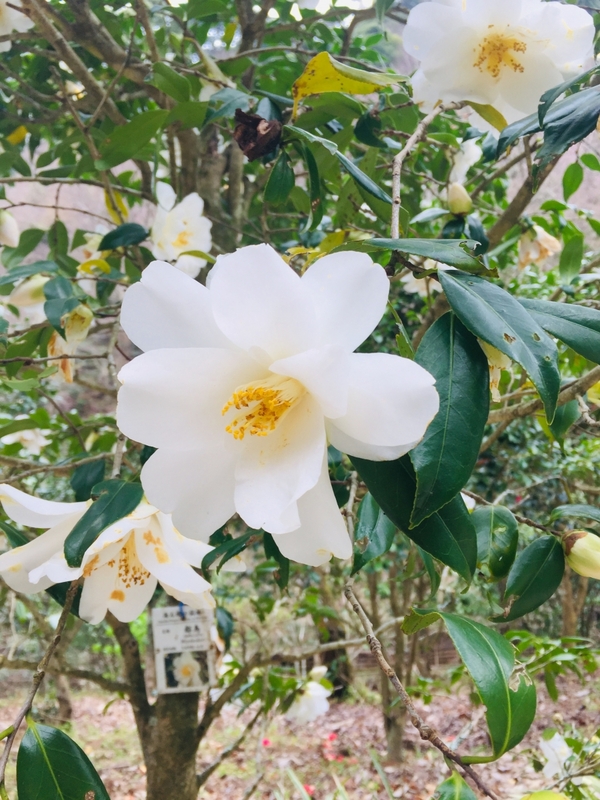 A white camellia tree in the hotel garden. The garden is a short walk up the hill from the hotel. An arrangement of camellia branches in the hotel lobby. Tubaki reinforced its reputation as a high-end ryokan with the stellar quality of its service, the comfortable rooms and soothing hot spring baths. 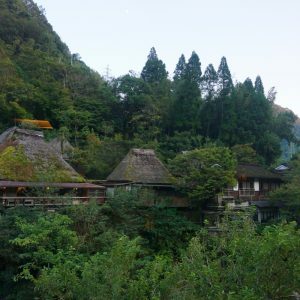 After an active day, a soak in the large, communal bath as well as our private rotenburo, or outside bath, followed by a sumptuous kaiseki, or multi-course, dinner and shiatsu massage in the room, we slept exceeding well that night. The Japanese breakfast featured himono, or grilled fish that has been salted and dried, which is a local specialty. On the second and final day of our excursion, we drove to Odawara Castle, which is famous for its plum trees, cherry trees and azaleas. There are only 12 original castles still in existence in Japan and Odawara is not one of them. The castle was originally built in the mid-15th century but was destroyed by an earthquake and subsequently dismantled. The current structure is a reproduction, albeit an impressively authentic looking one, which dates from the 1960s. 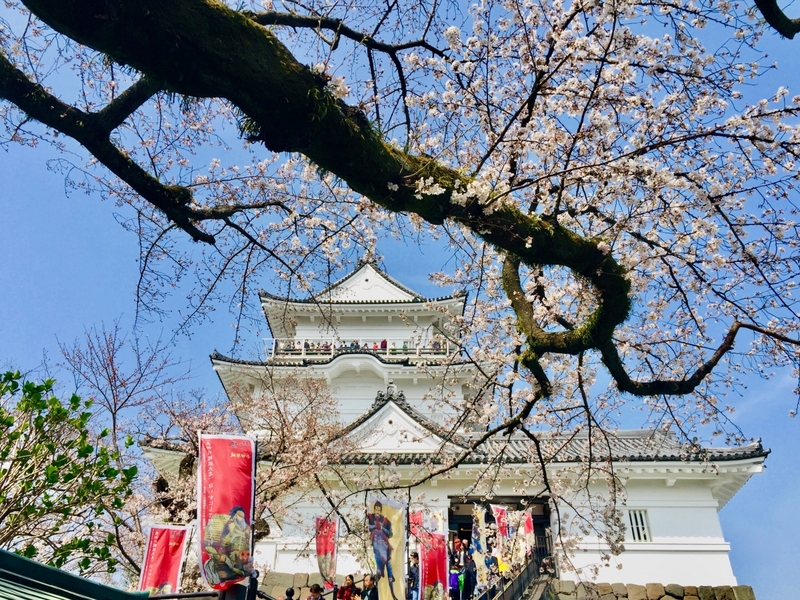 There was a festive atmosphere when we arrived at the castle, with stalls selling snacks and souvenirs and visitors taking selfies of the cherry blossoms against the imposing castle in the background. 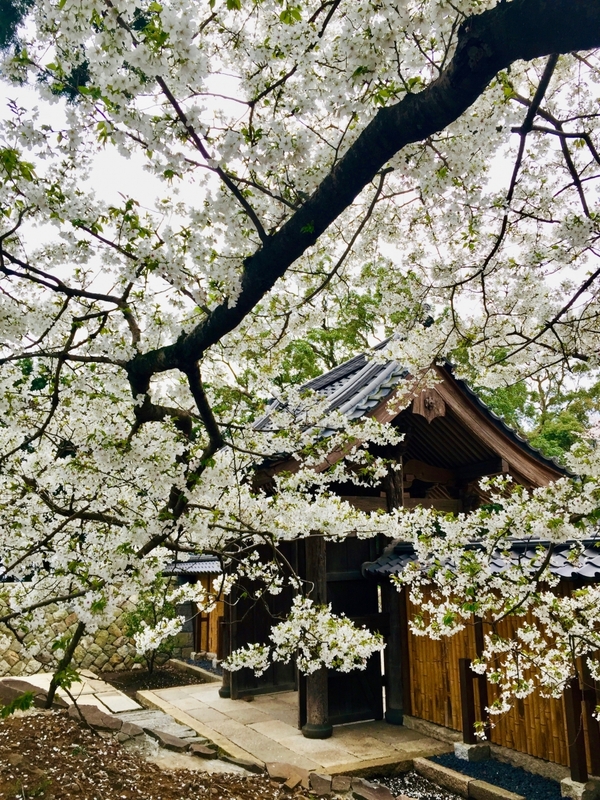 Odawara Castle is a favorite spot for cherry blossom viewing. 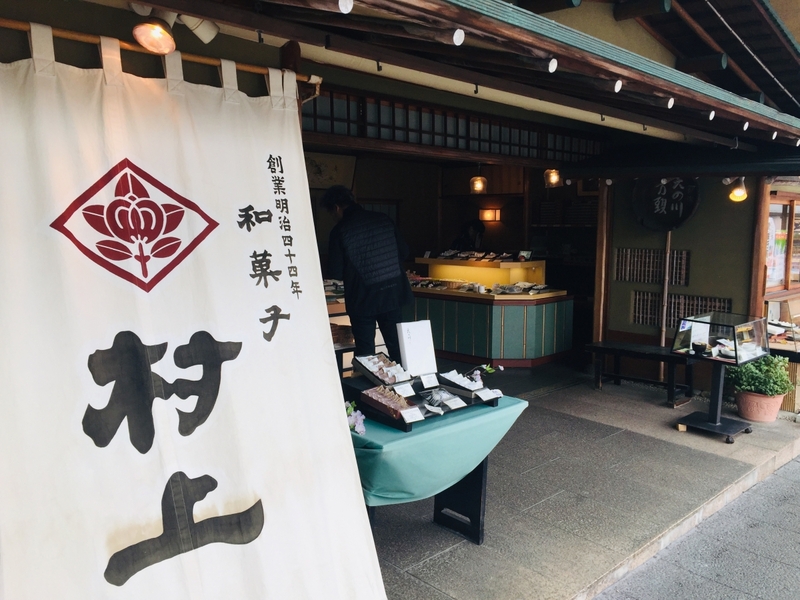 We left Odawara happy to have enjoyed the beauty of both sea and land and determined to visit the Enoura Observatory and experience its beauty again in a different season and different part of the day.